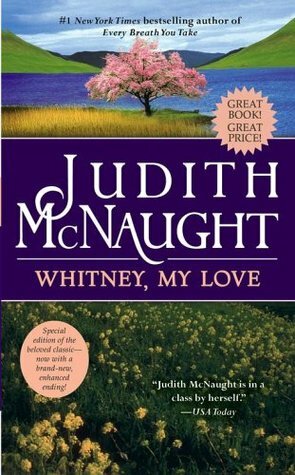 Whitney, My Love stands as Judith McNaught’s timeless bestseller — a novel so rich with laughter, tears, and the power of dreams that millions of readers have returned to it again and again to savor its beauty and majesty. Under the dark, languorous eyes of Clayton Westmoreland, the Duke of Claymore, Whitney Stone grew from a saucy hoyden into a ravishingly sensual woman. Fresh from her triumphs in Paris society, she returned to England to win the heart of Paul, her childhood love . . . only to be bargained away by her bankrupt father to the handsome, arrogant duke. Outraged, she defies her new lord. But even as his smoldering passion seduces her into a gathering storm of desire, Whitney cannot — and will not — relinquish her dream of perfect love. Did I like Whitney, My Love when I first read it? Oh my, YES. I couldn’t get enough of it. It was one of those books that I reread as soon as I finished. Age I first read Whitney, My Love: My late teens/early 20’s. Would I read Whitney, My Love now? YES!!!! It is one of my favorites. How many stars did I give Whitney, My Love back then: 5 stars. Have you read Whitney, My Love? I love to see that this has held up for you!